My girls love, love, love fruit snacks! 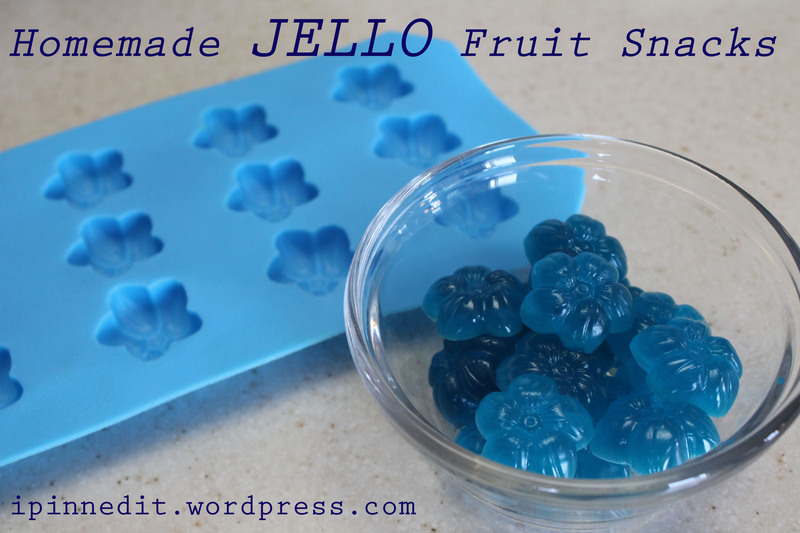 I saw this post for homemade jello fruit snacks and thought it would be fun for my girls and I to make together. My 4-year-old helps me cook all the time, but this is the first time I let my 23 month old get into the action! Molly really seemed to enjoy dumping the jello into the bowl and mixing! Most of all, she enjoyed eating the fruit snacks. This was a really fast recipe to make and fun, too! The texture turned out to be fruit snack like and they tasted exactly like Jello (as expected). I would be interested in making another homemade fruit snack recipe that isn’t Jello flavored. Don’t get me wrong, I’m a fan of Jello; however, I don’t really like my fruit snacks tasting like Jello. I will definitely make these for the girls again! 1.) Dump your water into a small saucepan. 2.) Sprinkle the gelatin (unflavored and Jello) over the water. 3.) Heat over medium heat and stir until dissolved. 4.) Pour mixture into ice cube trays. 5.) Wait 20 minutes for the fruit snacks to form. I thought this was so pretty and perfect for a St. Patrick’s Day project. And oh boy, it was a time-consuming project. I started the purple jello (bottom layer) at 9am. The entire thing was ready to eat at 7:30pm. I probably could have done it faster, but errands, making lunch, other fun projects got in the way of staying on track. I will say though that you have to be on the ball to get this thing done in one day! And, make sure to use the quick method (use ice) when making the jello. The kids loved it! My 19 month old devoured it! It was fun to taste all the flavors. My four year old liked “blue” the best!